My dog loves nothing more than her daily hike around the lake and through the backcountry of her new rural home. But we have come to learn that there is nothing more aggravating for pets or pet owners than dealing with fleas. Whether it’s the skin irritation that comes with fleas or the potential for diseases and other side effects from flea bites, fleas are every dog’s worst nightmare. Luckily, this article comes with several recipes for homemade flea spray for dogs as well as some other tricks and tips to help you lead a flea-free life. You can try out these different home remedies and figure out which one, or ones, best suit you and your family. Rather than struggle with a flea comb or flea collars, you can keep fleas away from your home with these natural remedies that are much easier to make than you think. There are plenty of different home remedies to choose from in this article, so you are sure to find some wonderful DIY flea treatment for dogs that fit your lifestyle. Apple cider vinegar, the panacea of natural remedies, can repel fleas, too! Pour a little apple cider vinegar into your dog’s drinking water (about one teaspoon for every 50 pounds) for a natural flea repellent. The apple cider vinegar changes your dog’s natural pH, and this aids in flea prevention. Use apple cider vinegar on your dog’s skin! 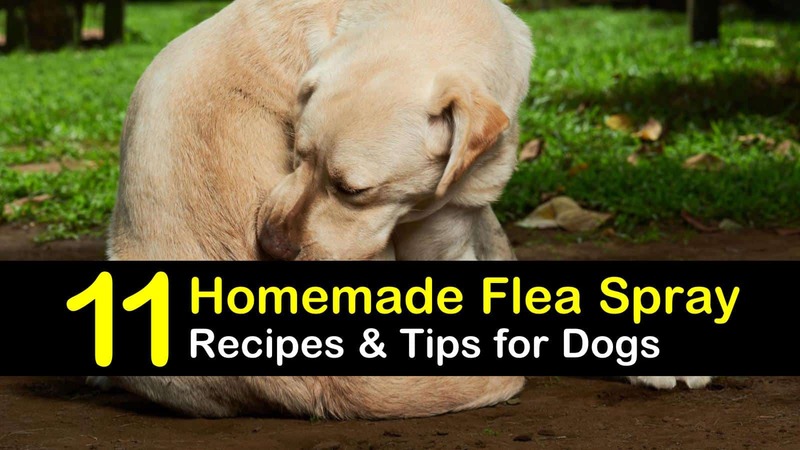 Follow this recipe to learn how to get rid of fleas with natural ingredients. Mix the ingredients in a clean spray bottle that has never held cleaning supplies. Spray the vinegar mixture onto your pet’s coat once a week. Do not to spray near their eyes! If you don’t have any apple cider vinegar lying around, but you do have white vinegar, you can use that to make an effective homemade flea spray for dogs, as well. Because the white vinegar is more pungent than the apple cider vinegar, you will need more water. However, the process is the same: mix the ingredients in a spray bottle and spray your pet’s coat. Again, be careful of the eyes! Another great benefit to this vinegar mixture is that it is also an effective dog ear cleaning solution. Moisten a cotton ball and wipe the inside of your dog’s ear. If your furry friend is not particularly fond of the vinegar spray options, you could try this lemon spray instead. Place the lemons in the water and let steep overnight. The next day, you can warm the water up slightly if you think that would make your pet more comfortable than cold water. Pour into a spray bottle and spray your pet’s coat and their favorite spots around the house. If you don’t have a lemon, you can use a few drops of lemon juice instead. For something that will have multiple natural ingredients and components to help your flea problem, you can try out this homemade flea repellent for dogs. Slice the lemon into rounds and place in a bowl with rosemary and sage. Next, heat the water to the point where it almost boils and carefully pour the water over the other ingredients. Let steep overnight and strain the liquid into a spray bottle the next day. Spray this onto your pet’s coat. This witch hazel spray is not so much a spray for your dogs as it is a spray for your house. Follow the recipe for a homemade industrial cleansing spray for your home and benefit from witch hazel, one of the most underrated home remedy. Mix the ingredients in a large spray bottle and spray your windows and windowsills, around your doors, on furniture and the carpets, and anywhere else you think fleas might be hiding. You will want to do this away from your dog. Make sure that your dog doesn’t start licking where you spray witch hazel as it can upset their stomach. If your dog doesn’t like the sprays, you can try a lotion instead. Here is a recipe for an oil rub. Combine the oils and apply a little behind their ears. Never mix an essential oil with water and then apply to your dog’s skin; the essential oils will not be diluted because oil and water do not mix. If you’re looking for a fashionable homemade flea repellent for dogs, then consider making a flea repellent bandana. This is quite helpful if you are going to be going on a hike or spending time outdoors with your furry friend. Take the above essential oil mixture and lightly coat a bandana with it. Remember to take the bandana off when you get back inside. When you see adult fleas crawling around on your dog’s skin, you need a quick solution. Lead your dog to the bath or shower, get some warm water running, and bathe your dog with gentle dish soap, like Dawn. The dish soap kills fleas by breaking down their exoskeleton. Thoroughly rinse your pet and make sure there is no soap residue left behind. You can spray your dog as much as you want, but the fleas may already be in your home. To help combat this problem, create a saltwater mixture of about 1 part salt to 3 parts water. Wash your hard floors and spray soft goods with this mixture. The salt dehydrates the fleas and serves as a natural flea killer. To help with the dehydration process, purchase food-grade diatomaceous earth and sprinkle it into your carpets. Diatomaceous earth breaks flea eggs apart, thus inhibiting future generations to create a flea infestation in your home. You could also use baking soda instead. Sprinkle it into the carpet and let it do its thing. There are several other cleaning and tidying tips for making sure your home remains free of a flea infestation. Break out the vacuum cleaner! Make sure you hit all of the areas where the walls and carpets meet, this is where fleas like to hide. You may want to vacuum as often as every day until you no longer see any adult fleas. Wash all of the bedding at home, including your dog’s bedding. The hot water will kill the fleas, and the clean bedding will keep new fleas from thinking it’s a safe place to hide (..). Hopefully, you found these different tips and tricks helpful. Keep in mind, the best line of defense for a flea-free home is a healthy dog, so make sure your dog food is giving your furry friend all of the necessary vitamins and nutrients that they need to be their healthiest selves. 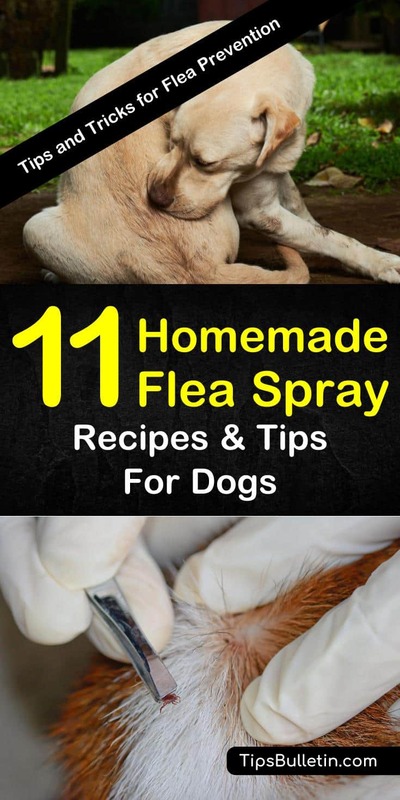 If you found this article about homemade flea spray for dogs useful, please share these various DIY flea killing tips with your friends and family on Pinterest and Facebook.